How can you create conversations that help others grow? How can you make every meeting a once-in-a-lifetime experience that inspires others? How can you be more present in all of your interactions? How can you be recognized as the best? 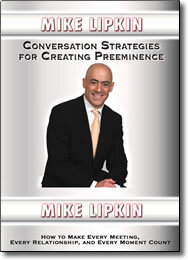 These and many more questions are answered in this unforgettable, power packed program featuring one of North America’s most extraordinary speakers, Mike Lipkin. As you become captivated by his South African accent, you’ll discover key insights and practical strategies for improving your conversation effectiveness in both business and personal situations.